I haven't met too many people who are neutral about pink, it's usually a love or hate thing. 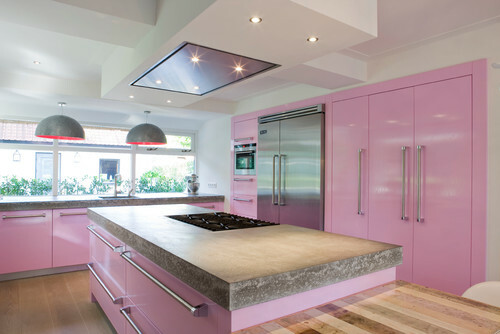 Maybe if I was single I would think about doing a pink kitchen, but I know there is no possible way that my husband would even allow a drop of pink in our kitchen! 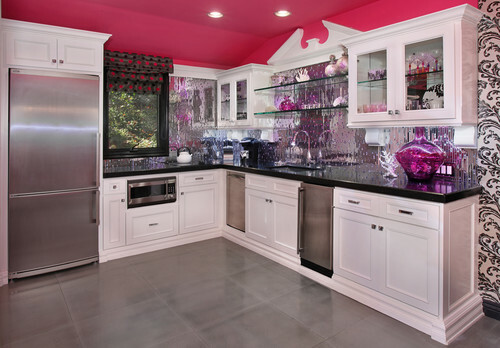 So today I'll just show pictures of fun, pink kitchens. I think this first kitchen from LivingEtc is my favorite kitchen of the day. I like that it's not overwhelmingly pink and it's a good color of pink. The backsplash is painted glass and the countertops are concrete. The sofa is amazing, but I'm not loving the rug. I think white or grey quartz countertops would be awesome in here. I like that this kitchen from the Nest Egg blog is pink only on the painted walls....the least inexpensive part of the kitchen to change when you are ready for a change and want to paint your kitchen yellow or turquoise or olive green instead. The countertops look to be granite. Okay never mind, this last kitchen is tied for my favorite of the day. The picture is from UK Glass Products. The backsplash is painted glass and I think the countertops are probably quartz. 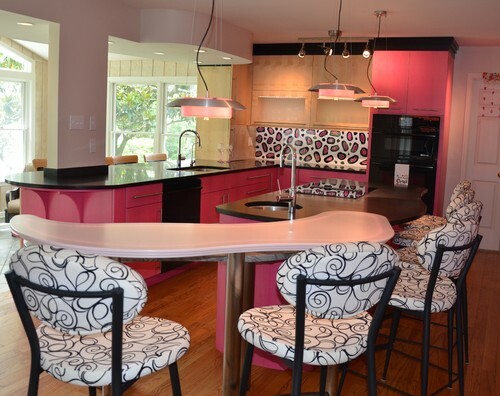 So, anyone out there want to admit that they either have a pink kitchen or want a pink kitchen??? Not really feeling the pink love. Although I was suprised at my reaction to the last two and the "hello kitty" one (I'm with you - sans the Hello Kitty). There was a lot I liked about them. Sadly, I remain stuck in my "brown period". I love this article - If I credit you in full would you mind if we re-published it on www.thekitchendirectory.co.uk ? I think our readers would love it! Melissa- I'm glad that I surprised you with the last two pictures! :) I think a lot of people are stuck in their "brown period" right now and that's totally great!